The problem of value pluralism permeates modern political philosophy. Its presence can be felt even when it is not explicitly the central topic under investigation. Political thinkers such as Max Weber, Isaiah Berlin and Stuart Hampshire derive pessimistic, sometimes tragic, conclusions from their reflections upon pluralism. On the other hand, there is a more optimistic view represented by John Rawls and Jürgen Habermas that sees value pluralism as a problem that is easier to live with. This book presents the first accessible overview for both post- and undergraduate students of the way in which this problem has been understood and responded to by modern political thinkers. Peter Lassman is a Lecturer in Political Science and International Studies at the University of Birmingham. "A well-written book that engages readers with its dense arguments and discussions." "Written in an engaging and accessible style, Peter Lassman's thoughtful and informed discussion of value pluralism does much to shed light on one of the most complex and practically pressing issues in political theory. The book will be invaluable for students, but specialists should also find it of considerable interest." "Peter Lassman has taken a major step forward in our understanding of contemporary political theory. He seeks in this book to call pluralism into question, not to condemn it, but to understand to what we are committing ourselves when we endorse pluralism. The results are important for all of us: he shows that consequent to the phenomenon of value pluralism as political theorists we are necessarily both spectator and participant in the politics of our times. One of the most insightful books about the practice of political theory that I have read." 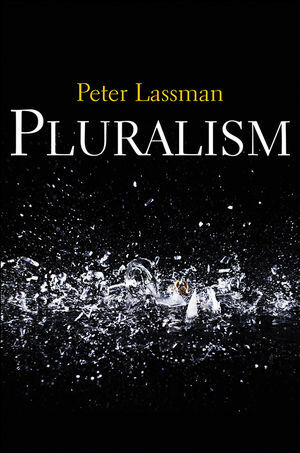 "With patience and care, Peter Lassman surveys the major arguments about pluralism and value pluralism in modern political theory. He is a sure-footed guide to the political dimensions of the work of Isaiah Berlin, Stuart Hampshire, John Rawls and Jürgen Habermas, but also adds his own voice, inspired by Max Weber, to these important debates." "Peter Lassman's book is an excellent guide to an increasingly important debate. It introduces several different thinkers' approaches to pluralism and draws out the crucial implications that those appraches have for broader theoretical debates. It is a work that will inform and inspire students of political theory for a very long time to come."